1. Come to Mass each Sunday, and invite your family, friends, and neighbors. 2. 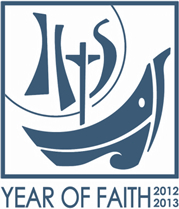 Enroll in the “Read the Catechism in a Year” emails (flocknote.com/catechism). 3. Visit the church where you were baptized and renew your baptismal promises with your family (to earn a special plenary indulgence!). 4. Spend a half-hour watching EWTN instead of your favorite sitcom. 5. Make a simple visit to a nearby shrine. 6. Try going to confession every month or every other month. 7. Learn to chant the Credo and recite the Act of Faith. 8. Get involved in the fight for religious freedom. 9. Check out Fr. Robert Barron’s Catholicism series on DVD (www.wordonfire.org). 10. Crack open your Bible for a few minutes before bed sometimes. Can you think of other ideas? Suggestions welcome!